My life has become busier and busier by the day. I thought that once Ralph starts high school, I'll have more time for myself. But, no. I ended up with lots of online tasks to finish, events to cover, and advocacies and ministry work to do. Don't get me wrong, I'm kinda loving it because I feel so important. So as much as possible, I make sure that I get everything what I need online. Groupon Goods has become one of my favorite online shopping sites. Almost everything is sold here. For the Goods category alone, for instance, the products range from clothes, accessories, home items, sports and outdoor paraphernalia, electronics, auto and home improvement, groceries, items for your pets, and even collectibles! Just look at this Bentgo Kids' Lunch Boxes that I found while I was looking for a bento box that I can bring with me all the time. Isn't it cute? Meanwhile, the Locals category display all available services while the Getaway category (my personal favorite, if you ask me), lists all budget-saavy trips to places all-over the world. One thing more that I like about it is that the products are not only affordable but they are also often on sale. Discounts can go up to 50% off so it will really make you crazy to shop! 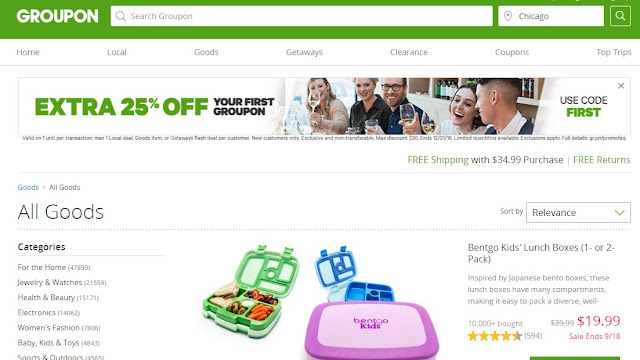 Why don't you try shopping with Groupon Goods today?